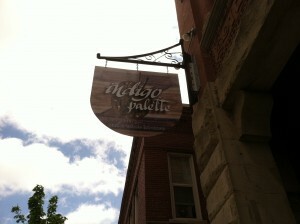 Some of the previous restaurants we had attended during this May Term class had artwork done by local artists, but none of them displayed as much artwork as the Indigo Palette does. That’s really to be expected from a place that considers themselves an art gallery first, though. I was excited for the Indigo Palette, but not necessarily for the food. 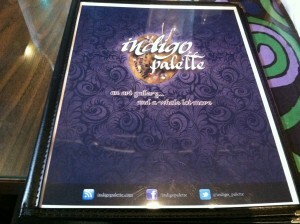 Like some of the other restaurants in this May term class, I had heard of the Indigo Palette, but had not been there. As an art student, I was planning on going there eventually, but this class arrived before I got the chance to go on my own. It’s safe to say I was more excited to see the place and the artwork than to actually eat there. 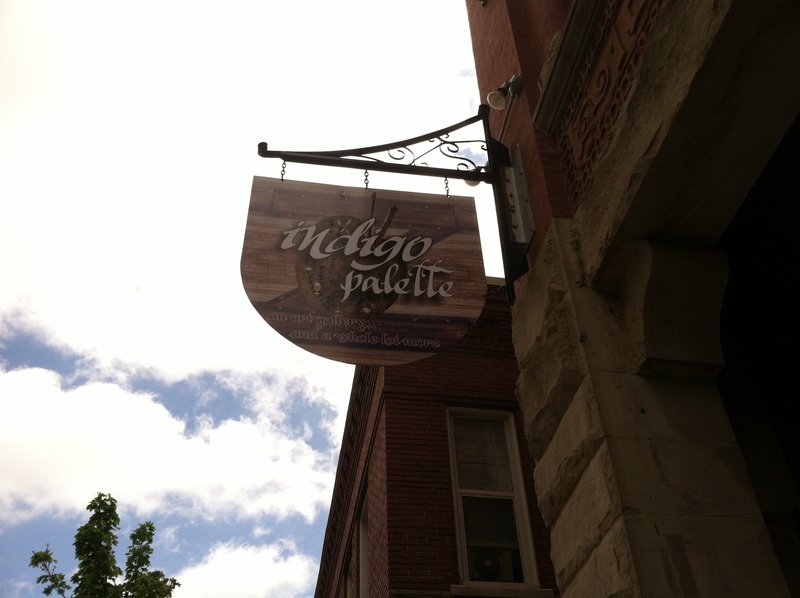 Arriving at the Indigo Palette, I first stopped to check out their sign and the logo. I was a underwhelmed by their sign and really wished they had done more. The wood texture on a tin sign looked kind of cheesy, and there was simply too much going behind the words. The drop shadow was way too far away from the words, and the painting palette and paintbrush was hard to distinguish. The images of the alcoholic beverages and the fork and spoon around the palette are an unnecessary touch, as well. I also disliked the tagline in black with a white stroke around it. I don’t think it needs to be on that sign first of all, but the white stroke around the text causes a lot of readability issues. The logo had several readability issues against that wood texture on the sign, but it didn’t look good anywhere else they used it either. All this sounds pretty harsh, but to be honest, I expected more from a place that focuses on art. They have such a cool look and idea, I hate to see them use a poor logo on top of it all. The inside of the restaurant had a great look and feel. The browns, blacks and indigo blue color scheme had a very artistic feel and went well with the environment. The walls were covered with various paintings, pictures, and artwork all of which were for sale. Right inside the entrance, there was a counter featuring jewelry and other smaller artwork for sale. On the other side, they had their bar. 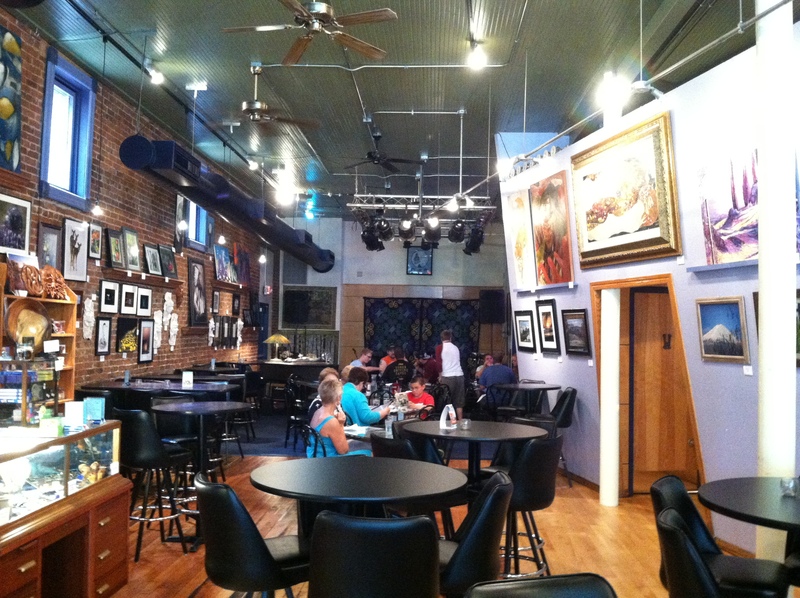 Tables spanned the entire length of the restaurant, with a stage for live music in the back. Again, the place just had an awesome look and is well worth going to just to check out the building and the artwork on display. 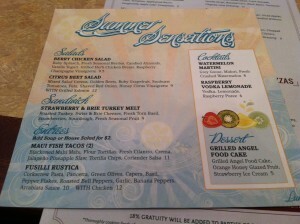 Moving onto the dining experience, the menus had a decent look. The cover was ok, except for the logo, and the typography used on the inside was ok. It could have done without the drop shadow under the headers and the font size was a little too large for my taste, but everything was still readable and you could easily navigate the menu. I ordered Kickin’ Cajun Chicken sandwich with a side of fries. The food actually exceeded my expectations. I didn’t expect the sandwich to be quite that good. 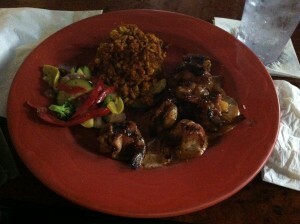 The grilled chicken was moist and tender and tasty. The chipotle aioli sauce and pepper jack cheese added that nice kick to the sandwich. It wasn’t overly spicy, but you could definitely tell it was “Kickin’.” The fries were a nice side, as well. 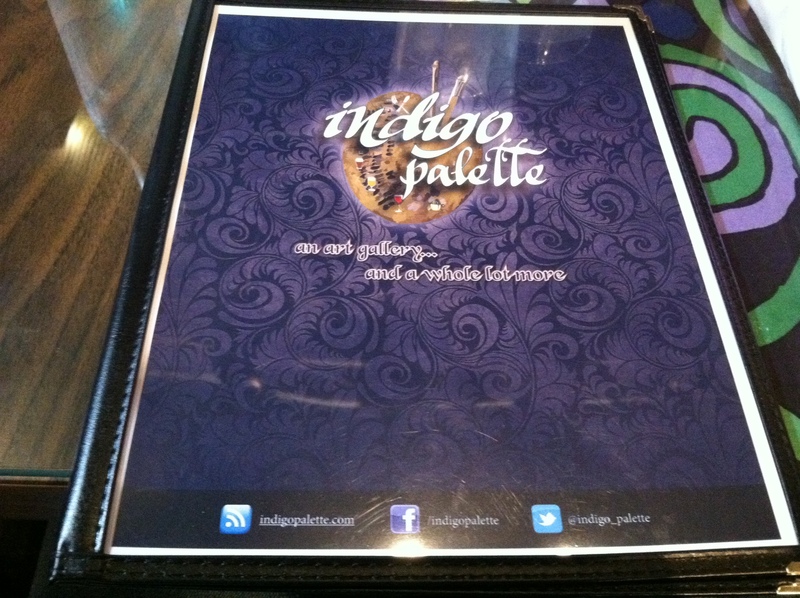 In the end, I will definitely be going back to the Indigo Palette, but next time it will be equally for the artwork and the food. 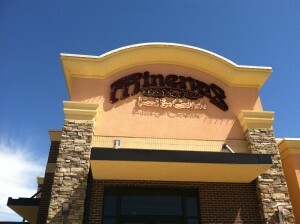 I hope the do something with their logo, but I hope they still keep their overall look and feel of the restaurant. Anyone who plans to go out to a bar takes into consideration what kind of environment the establishment has. You could be looking for a cheaper college bar, a more expensive martini bar, or even a festive nightclub environment. Buffalo Alice has the reputation to fit under that latter category. 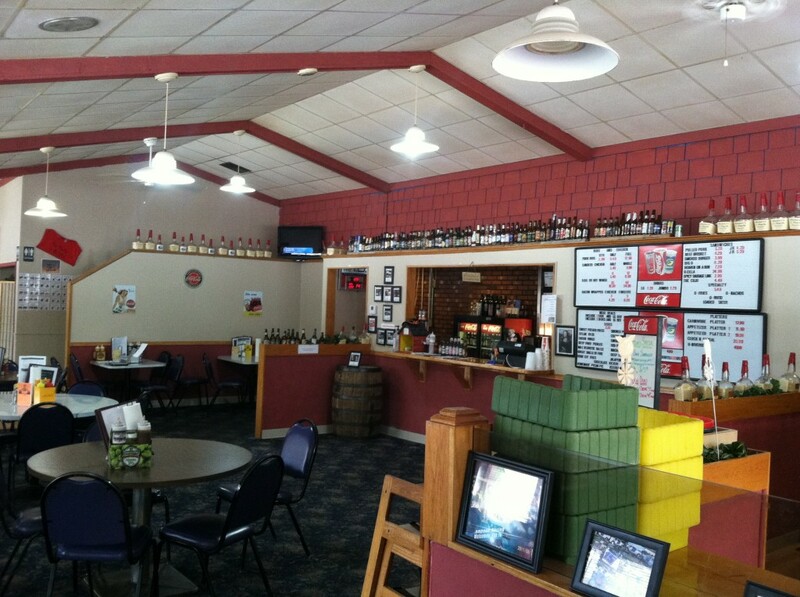 More affectionately called BA’s, this bar has been a mainstay in Sioux City since 1976. 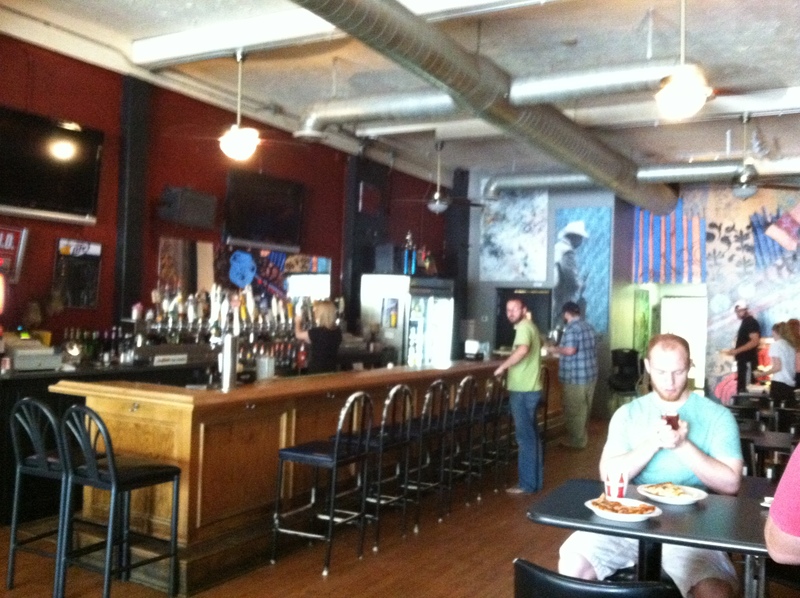 It’s known for their pizza, beer, and fun environment. Having never been there before, I was curious to see what all the fuss was about and to see if they really lived up to the expectations. 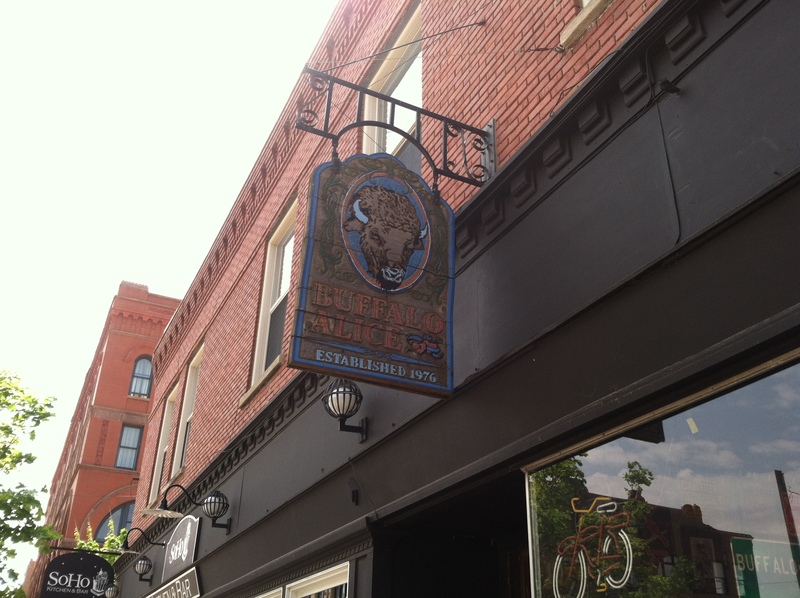 Upon arrival to BA’s, I first noticed their sign hanging outside of the bar. Their logo was painted on weathered wooden planks. I was really impressed with the look, it had a classic “western” feel to it between the paint colors, the wood, and the illustration of the buffalo. I liked the color choices, the blue and the reddish-orange, but both of the colors, particularly the reddish-orange, was a little hard to see on the wood background from a distance. I would have liked to seen the words “Buffalo Alice” in white to help with the readability. They had a several signs in the window that helped a customer figure out what this place was, but the sign would be tough to read if you were driving by. I am curious why the hearts and arrow illustration are in this logo. They don’t seem to belong. To me, it looks more like a tattoo drawing or something, but they just don’t seem to fit with the rest of the appearance of the logo. Perhaps there’s a story behind it, but I don’t know of it. Inside, BA’s is separated into 2 different sections. The front part seems to be more of the bar side while the other side was more of the dining area. The “bar” side had a ton of signs hanging up all around, giving it a “festive bar” feel. The “dining” side didn’t have hardly any signs, and was instead decorated with artwork. After a little research on their website, I discovered that they were all done by local artists. There was a very large mural of different musicians throughout musical history. I liked this look for this side, perhaps even more than on the other side, but that’s probably because I’m an artist myself. Both sections of BA’s had a very large bar, with several beers available on tap. We arrived at BA’s for their lunch pizza buffet, so in the back of the “dining” side, they had a buffet with about 4 or 5 different pizzas. On the closest table to the buffet, they had salad and a tray of brownies. I grabbed a slice of supreme pizza that had olives, peppers, mushrooms, pepperoni and sausage and another slice of sausage pizza. 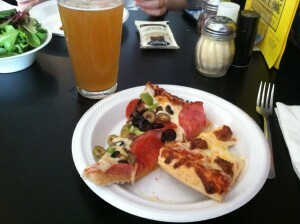 My impressions were that the pizza was simply OK. It wasn’t good, but it wasn’t bad pizza; it was just pizza. There wasn’t really anything special about it and it didn’t live up to the expectations that I gained from others telling me how good it was. In the end, I would say that Buffalo Alice isn’t a place I would advise going to for the food. To me, you would go to BA’s for the beer, the people, and the environment, and only if you got hungry and didn’t want to leave yet, would you get the pizza. Perhaps it was because it was a lunch buffet that it wasn’t all that impressive. I was, however impressed by their logo and aesthetic appearance. I really appreciated their rustic feel with their logo and the “festive bar” inside BA’s. You can’t help but to enjoy a restaurant that maintains a great aesthetic to go along with their delicious food. 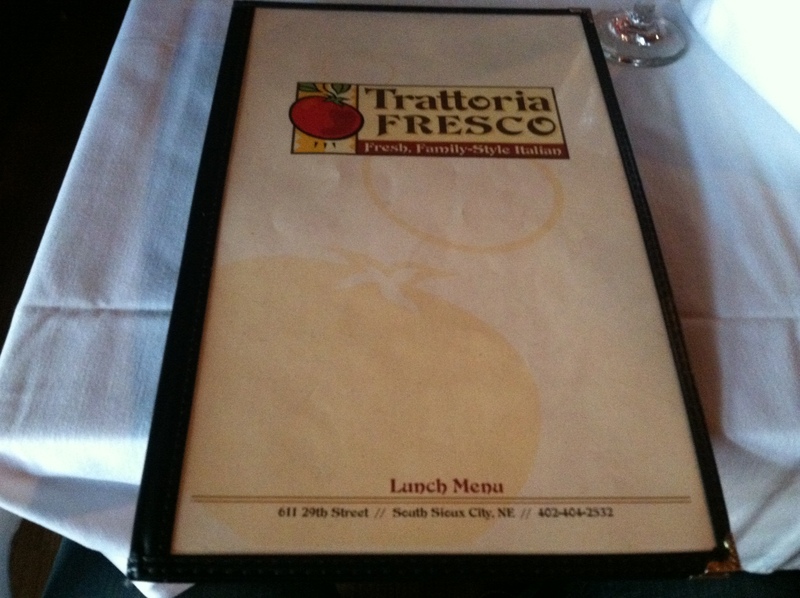 Trattoria Fresco clearly understood that their appearance could have just as much effect on their customers as the food itself. I wouldn’t say their application of branding was perfect, but they clearly had a passion for looking and feeling like an authentic restaurant. 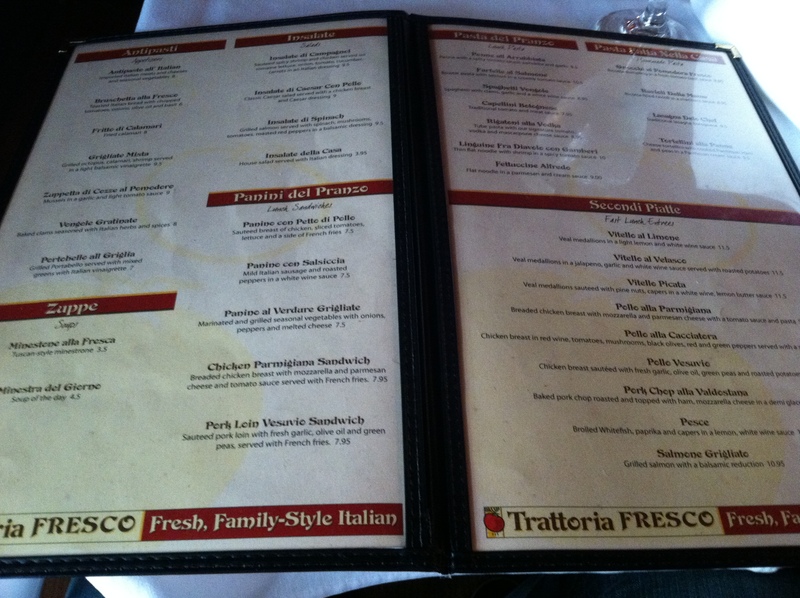 Previously, I had heard of Trattoria Fresco but had not eaten there before. 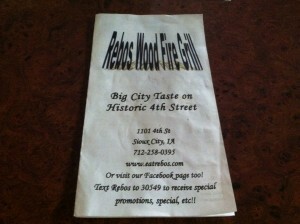 I was excited to eat here as I had been told it was an interesting place with delicious food. 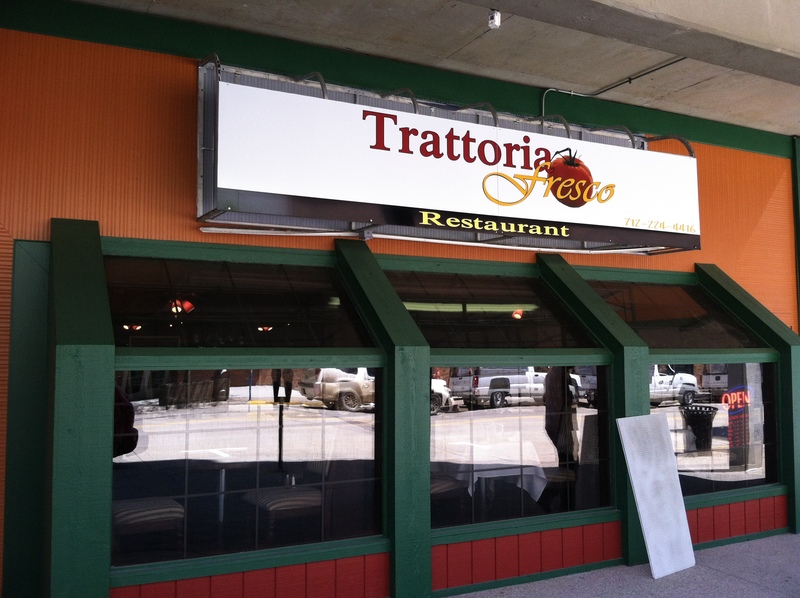 I was also very curious to see how they would apply their identity and branding and how the aesthetics of the restaurant would appear as an Italian restaurant in Sioux City. Finding the restaurant wasn’t as easy as I hoped. The restaurant itself is tucked under an overhang on 6th street, which prevented someone driving by to see it, unless they were really looking for it. Once I found it though, I was very impressed by the storefront appearance. They had part of restaurant extruding from the rest of the wall in a unique way. The area was mostly made of windows, with a few small tables inside the area. It looked very intriguing and appeared as though it would be a perfect area for a romantic dinner from the movies. Their signage and logo design was underwhelming for me, though. The restaurant had a lot of things going for them to make it a really cool experience for any customer, but their logo work looked a little amateurish for the rest of their restaurant. It wasn’t terrible, but it was definitely an area on which they could improve and develop a really cool appearance for themselves. The dining area of the restaurant had a really cozy and comfortable feel to it. 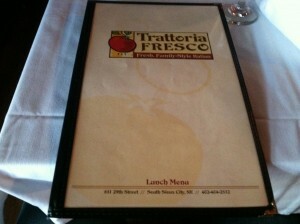 It simply felt like a great place to eat an Italian meal. The appearance added to the authentic Italian feel they were trying to achieve. It could appeal to a couple looking for a romantic dinner or to a family looking for a comfortable place to dine. 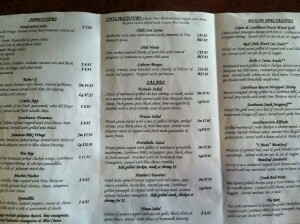 Looking over the menu, I was again, underwhelmed by the logo, but impressed by the layout of the menu itself. It was easy to navigate with great descriptions to help customers understand what they were ordering. Our waiter was friendly, although he did make a few mistakes with some of our orders and wasn’t the fastest either. We did learn later though that this was his first week, so I think he will improve with a little time. The owner of the restaurant, Israel, helped out and served our food. After our group talked with him a bit, I could tell just how passionate he was about his restaurant and ensuring every customer had an enjoyable experience. I really appreciated his attitude and friendliness. For my meal, I ordered the Fettuccine Alfredo with grilled chicken. 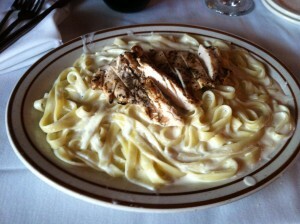 It had a wonderful flavor and the alfredo sauce was perfect. The chicken was tender and moist and blended very well with the rest of the meal. It was a great meal and just made me want to return again and try something else. Our group ordered a few desserts to try as well. They were all amazing. 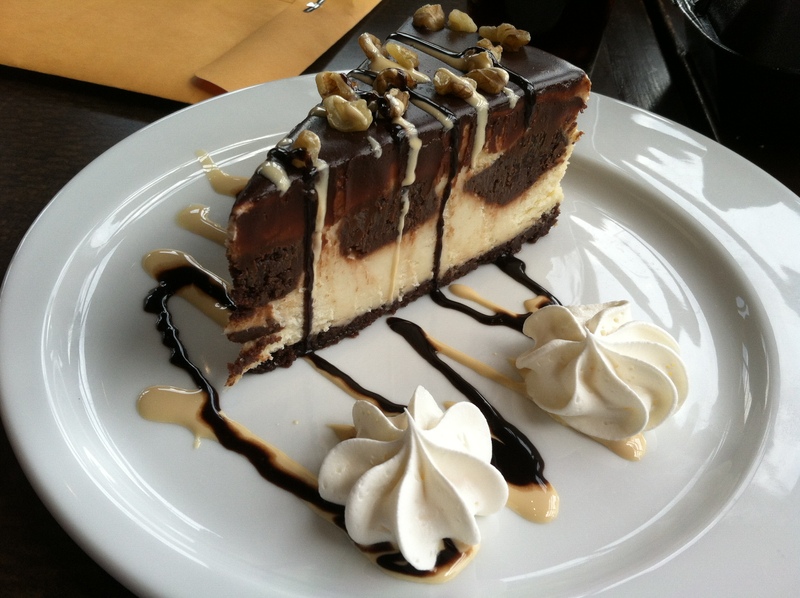 The one that sticks out in my mind was the ganache. Part of it was like a chocolate truffle. All of it was mouth watering and delicious. I wouldn’t feel any shame in simply returning to Trattoria Fresco just for that dessert again. 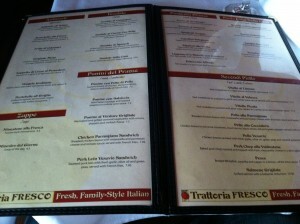 I had a really good overall experience at Trattoria Fresco. The food was spectacular and easily worth a return trip for that alone, but the aesthetics and feel of the restaurant helped with my good experience. In the end, though, I hope they consider improving their branding in order to just add to the already good experience. 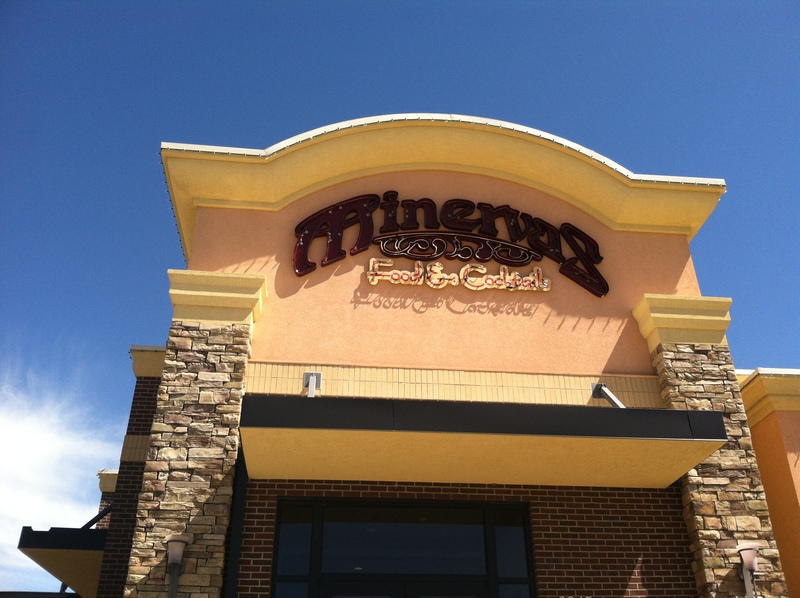 All restaurants can benefit from a quality identity appearance. There, I said it. 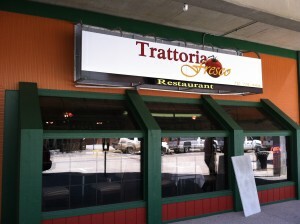 Quality branding can only help a restaurant (or business) to attract customers. Sure, some places are very successful because of their reputation, their history, or their food without having a decent branding. But adding a quality appearance to the mix will only help them attract customers. The Tokyo Japanese Steakhouse clearly understood this from my opinion. 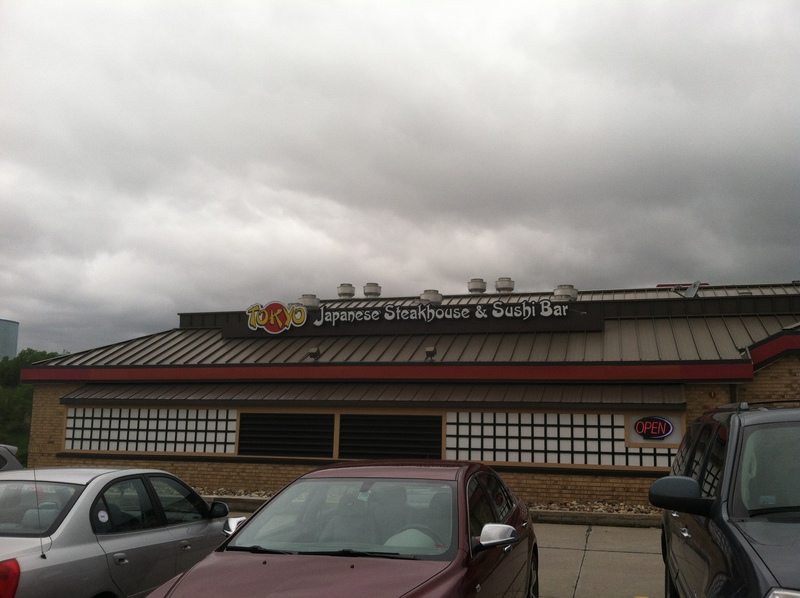 To differentiate themselves from the other Asian cuisine restaurants in Sioux City, they applied themselves to creating a quality look to the appearance of both the outside of the restaurant and the inside. This look helps to raise expectations of quality from customers and the Tokyo Japanese Steakhouse backs it up with a great eating experience and delicious food. 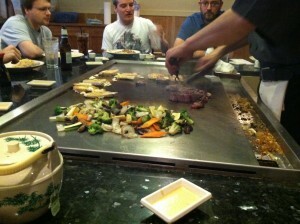 I had never been to the Tokyo Japanese Steakhouse before this May Term class. Most of my reasoning is that Asian cuisine doesn’t interest me as much as other food choices. I will admit, though, their branding and appearance from the outside of the restaurant always intrigued me. 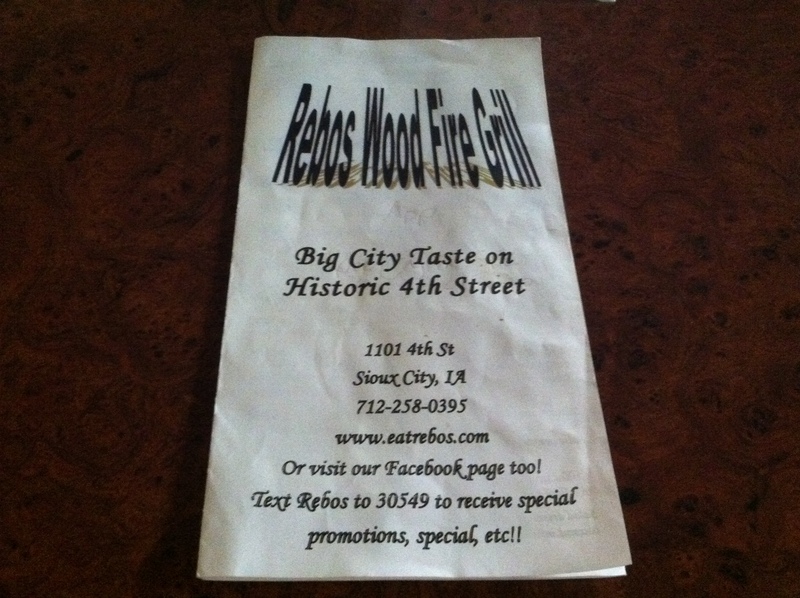 It looked like a quality, and interesting restaurant and I was bound to go there eventually just because of that. They clearly understand that to get customers into the restaurant, they need to have a quality appearance from the outside in order to show that they have good food to back it up. Approaching the restaurant, anyone can easily see their sign and restaurant from the road. You can also quickly understand that it is an Asian restaurant without ever entering the parking lot, which will help them attract new customers. They have a good location, too. They are just off a well-traveled road and are very visible from a distance. Their signage is readable and identifiable leading to a quick understanding of what they are. It just looks like a fun place to eat. Entering the restaurant, they continued that themed appearance throughout the experience. 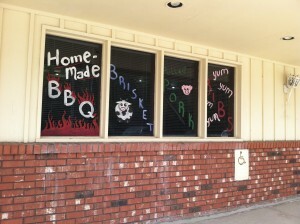 Sitting at tables surrounding the grill area adds to the experience of eating here. The chef was entertaining and friendly, as were the rest of the staff. The plates and napkins were presented nicely at everyone’s sitting area. 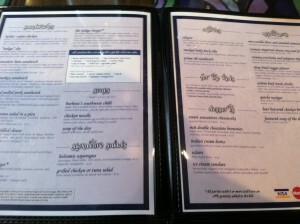 The menus were well done – easily the best menus we had seen so far during this class. They were in leather-bound book form and looked professional and made with quality in mind. Their logo is embossed in gold on the cover adding to the professional look. The layout of the text was well done and easy to navigate. Items were organized and listed out, adding to the readability. 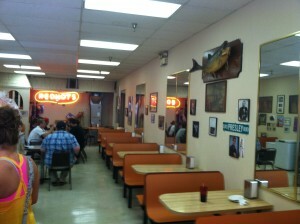 The counters were made of a granite-looking material and everything, including the grill, was spotless clean. 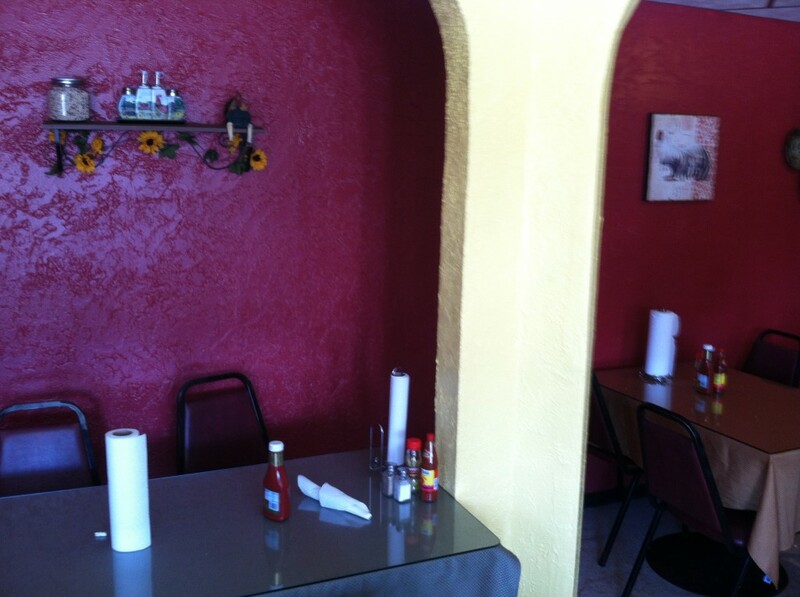 The overall appearance of everything just added to the professional and quality appearance of the restaurant. At this point, anyone eating there would be under the impression that this restaurant and its employees and owners took their job seriously and only wanted to give the best experience to their customers. 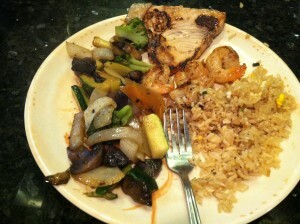 I ordered a lunch combination of swordfish and shrimp, with vegetables and rice. 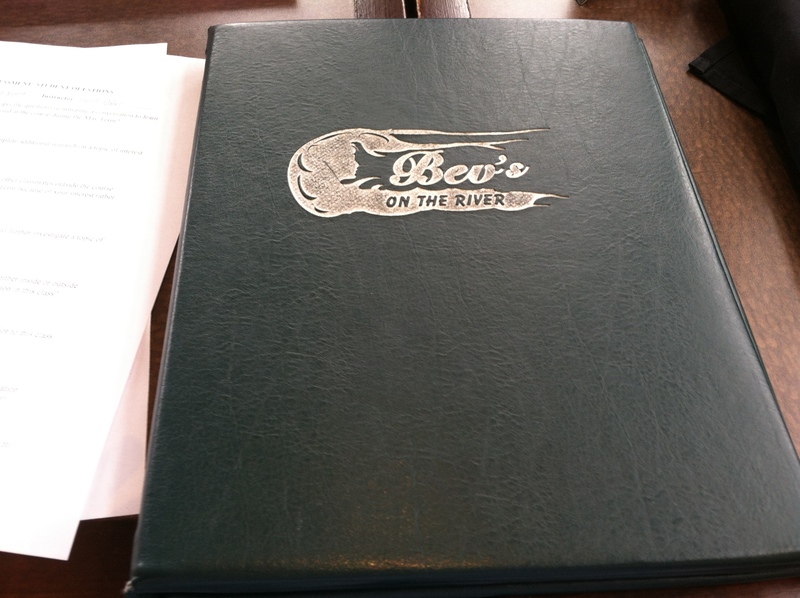 Other items on the menu included lobster, chicken, steak, mahi mahi, calamari, and more. 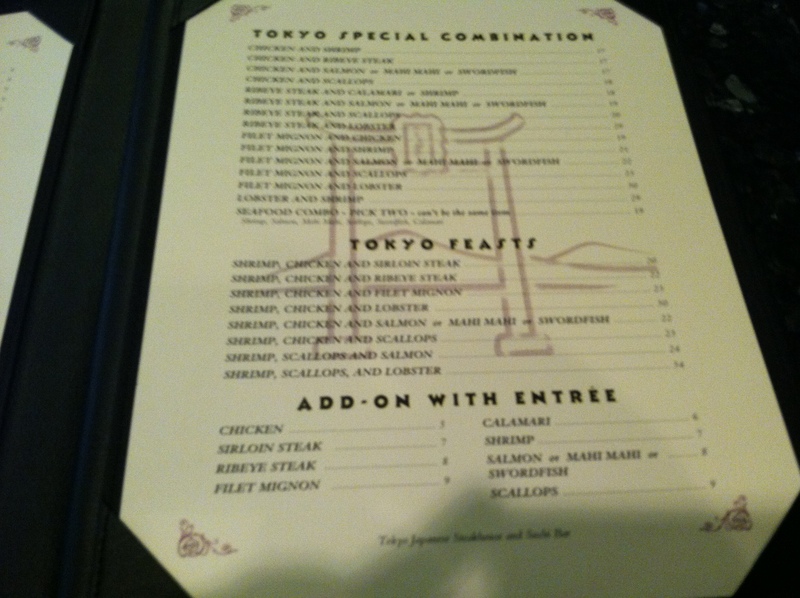 They had plenty of unique things to order from the menu, ensuring that there was something for everyone. The chef brought out the food and started cooking up the rice and vegetables on the grill. He was very entertaining, talking with us and chopping up the food in interesting ways. He started out by giving us all our rice before moving onto the meat and vegetables. 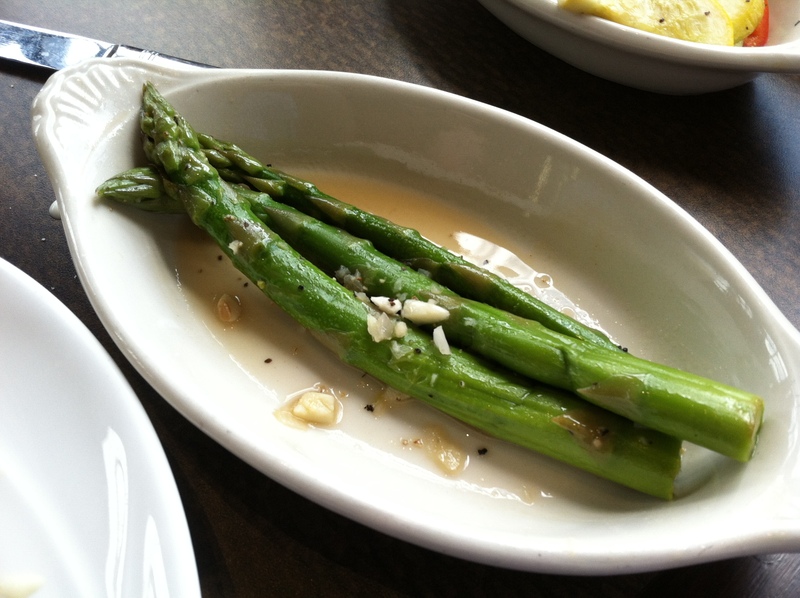 The rice was seasoned with a garlic butter, which added to the flavor of the rice in a great way. The rice was so tasty, that I needed to remind myself a few times to hold off on eating it all before I got the rest of my meal. After a bit, we were served the rest of our meal. Everything tasted very good with a Asian flavor to all the food items. The shrimp was delicious. It was fresh and seasoned nicely and blended very well with the rice and vegetables. The swordfish was good too, though I probably wouldn’t order it again. It reminded me a bit of pork, but with the classic “fishy” flavor. Again, it was good and flavorful, I just think there were better things on the menu, but it was fun to say I ordered swordfish for lunch. 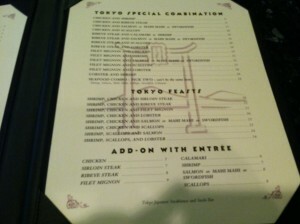 My overall impressions of the Tokyo Japanese Steakhouse were very good. It was an enjoyable experience, both from the designer side and the food lover side of me. The identity and appearance of the restaurant was very good and applied to the quality and tastiness of the food the served. I would absolutely return here to enjoy the experience all over again. It’s not everyday that you go to a restaurant and order a hot dog, let alone two different restaurants. 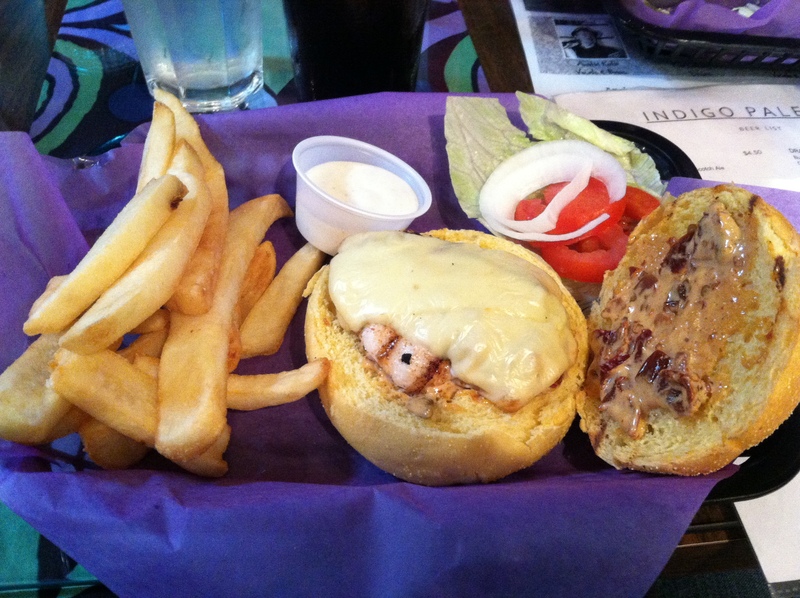 That’s what happened on Thursday for our latest ‘Eating Siouxland’ trip, though. 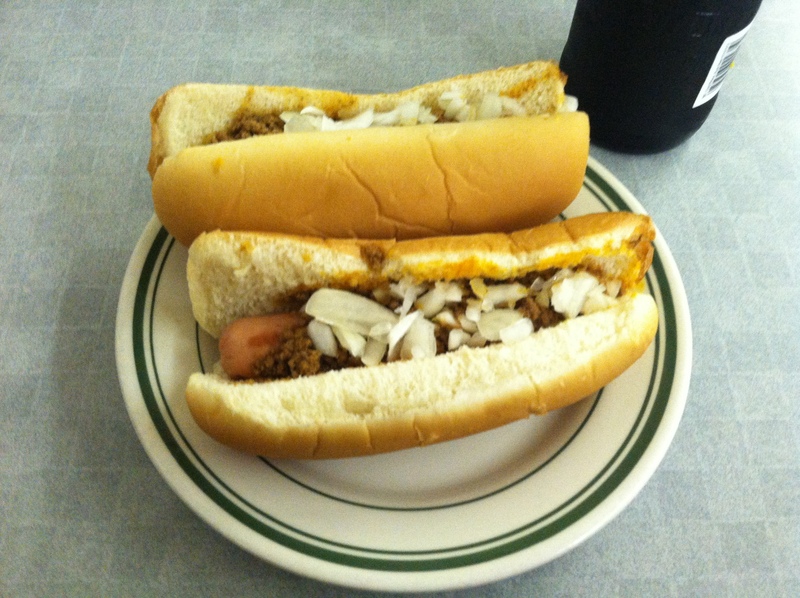 We grabbed lunch at two of Sioux City’s long-standing hot dog restaurants, Milwaukee Weiner House (Pearl St.) and Coney Island Weiner House No. 1 (Nebraska St.). It quickly became a competition between the two, comparing and contrasting the differences between the two. In the end, considering everything, Milwaukee’s walks away with my vote for the Sioux City hot dog title. I have eaten at Milwaukee’s five or so times since I began attending school at Morningiside three years ago. I had not eaten at, nor even heard of Coney Island before this class. 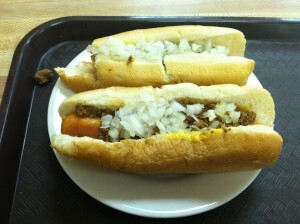 In fact, there is another hot dog place, George’s #1 Hot Dogs, which I had not heard of until this class, either. A few friends suggested Milwaukee’s to me and I was never informed that there was other places available. I think a lot of this is that these types of restaurants are the places that get a lot of repeat customers from people who went there as kids, and they only go back to the same places and order the same things. I think it’s safe to say that restaurants that specialize in one particular type of food like these hot dog places are considered good if they have consistency over the years. 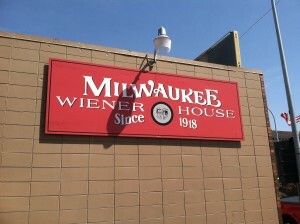 That said, I think the Milwaukee Wiener House benefits from a few things that Coney Island is missing out on. One of the first beneficial things is their location. Milwaukee’s is a self-standing building that is noticeable, on a busy street, with easily accessible and available parking. With a giant logo on the side of the building, Milwaukee’s is noticeable from a distance. Coney Island on the other hand, is a little further into downtown Sioux City, squeezed in between a block of buildings, without any really noticeable signage. 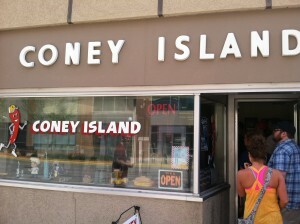 Parking isn’t as easy as at Milwaukee’s, so I’m assuming most people that eat at Coney Island enter as foot traffic. 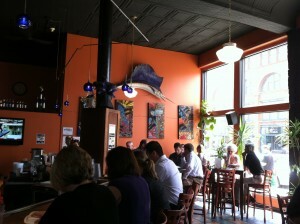 Milwaukee’s is also benefiting from much more publicity online through reviews on Urbanspoon and Yelp. I think this leads to more notoriety to attract those who are not from Sioux City, like myself. I think Milwaukee’s is also benefiting from their overall branding and appearance at their restaurant more than Coney Island. Both restaurants have an authentic vintage feel, but I felt that Milwaukee’s has stood the test of time better. Walking into the place, you feel like you just stepped back into 1960. It’s the type of place you expect to see Don Draper from Mad Men to grab a bite to eat at. That vintage look is really popular today, in part because of shows like Mad Men, and seems to translate better with most rather than other time periods. Although Coney Island, has that same feel, and in part, that same appearance, it just feels more old than classic. The entire experience at Milwaukee’s gives that vintage feel: the plastic booths, the logos and illustrations, the paper hats, and even the pop in the glass bottles. Coney Island doesn’t have that same feel throughout the entire experience. Although, the storefront looks vintage and could be used as a backdrop in a Wes Anderson film, the inside doesn’t quite have that same feel. Perhaps it’s just that pop culture has made the era’s restaurants look more like Milwaukee’s than Coney Island, but I still feel that Milwaukee’s has stood the test of time in this area. On a related side note, recent news has said that Milwaukee’s will be moving to a new location because of the Hard Rock Casino being built in downtown Sioux City. I wonder if they will attempt to keep that classic vintage look they have now, or try to modernize. My gut tells me they will keep the same look, but I truly hope they don’t try to mix two different looks and lose what they have already. Upon arrival at Milwaukee’s, I ordered 2 “hot dogs with everything,” meaning the usual Coney Island style: chili, mustard, and onions. 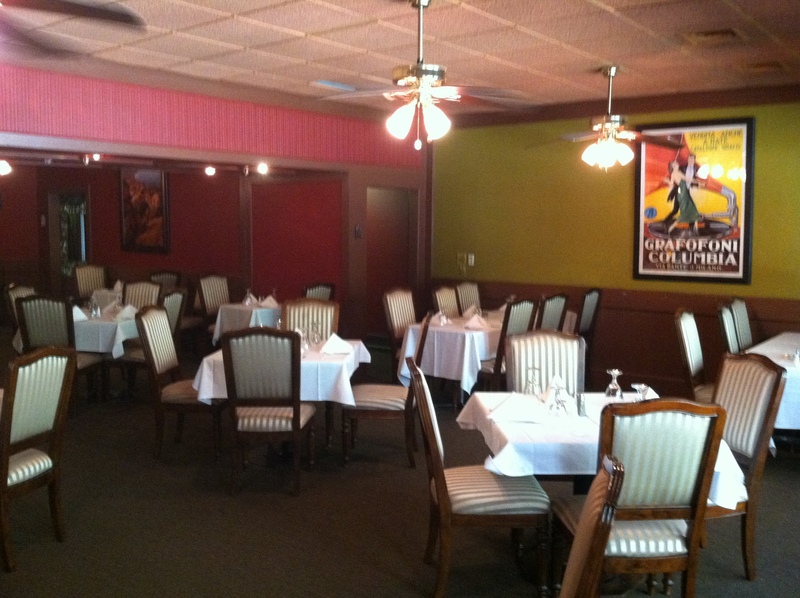 The service has always been quick, with one of the owners swiftly putting together the meal from years of experience. Although the lines can get long here, the service is so quick that it isn’t even that noticeable. Plus, the restaurant is large enough that it can accommodate large noon crowds. The hot dogs were just as I expected, the warm, extra soft buns holding a perfect mix of mustard, chopped onions, and finely ground chili meat on a hot dog. As I mentioned before, consistency is key, and the hot dog tastes exactly as it did on my first trip there 3 years ago. After this, we walked the few blocks to Coney Island, where I ordered the same thing, 2 hot dogs with chili meat, mustard, and onions. One thing to note was that the service here was not quite as speedy as at Milwaukee’s. Neither place expected our group of 20, but Milwaukee’s is prepared for a rush like that on a daily basis. It doesn’t seem that Coney Island gets a rush of people like that, nor would they have room for something like that as their restaurant was not as large as Milwaukee’s. Coney Island was very much so a mom and pop restaurant with the couple working the counter. 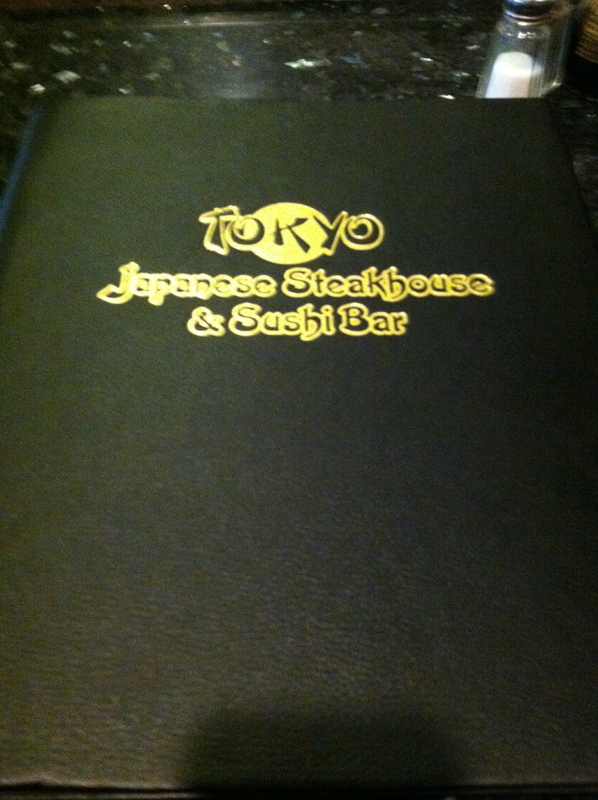 Service was very friendly and accommodating so no complaints there. The hot dogs were very good here, but noticeably different from Milwaukee’s. Both the onions and the chili meat had a different flavor than their competitor’s. The chili meat at Coney Island was a little bit thicker in consistency, while the onions at Milwaukee’s had a more noticeable flavor. 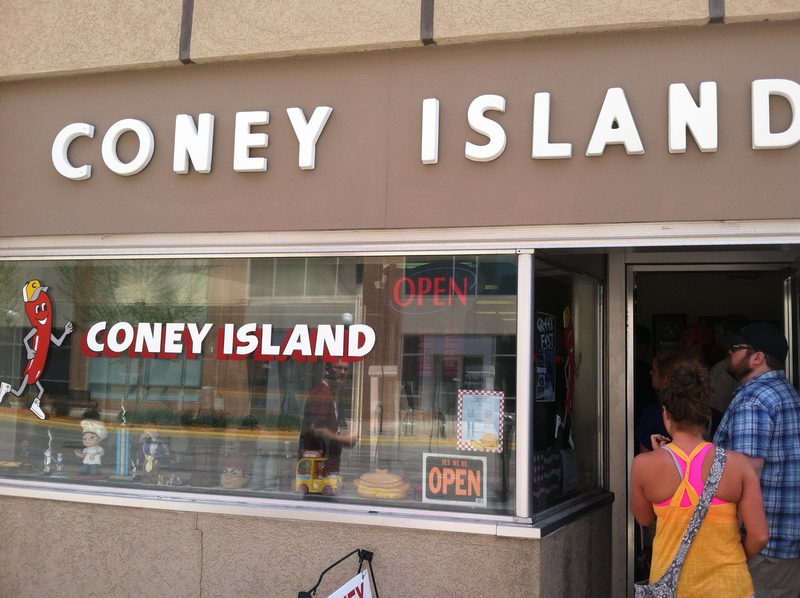 One other noticeable difference between the two was that Coney Island had things like French fries and onion rings for their sides, while Milwaukee’s only has potato chips. Really, in the end, I think my vote in favor of the Milwaukee Weiner House hot dogs comes a mix of experience with their consistency and their branding and environment. Both are equally good restaurants and I would recommend all who wish to try one of these places for the first time, to try them both. 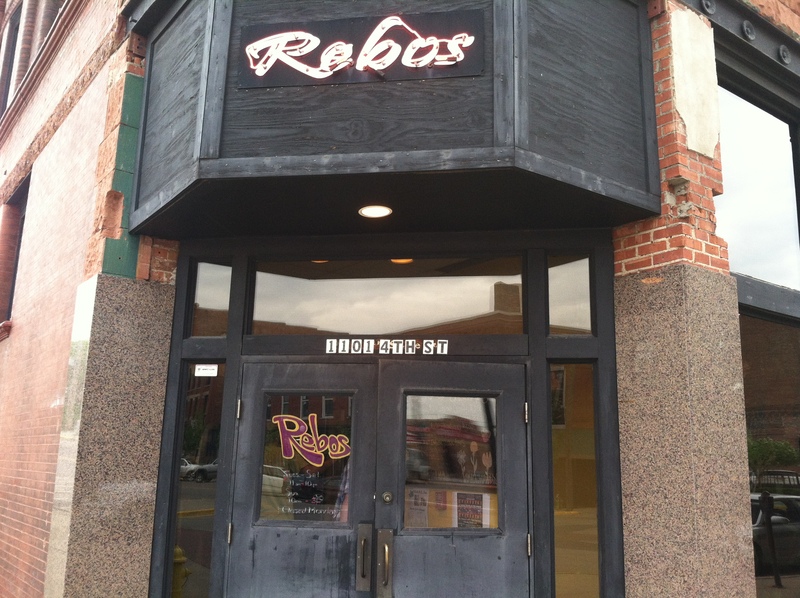 “Food for the soul.” That’s the slogan for Red Bones Café, the most recent restaurant we attended for our Eating Siouxland class. I like the sound of that – “food for the soul.” It makes you feel all warm and fuzzy and excited for some home-style food. But as always with a restaurant, the food is the determination of how accurate that slogan can really be, and I think Red Bones Café delivered that message perfectly. 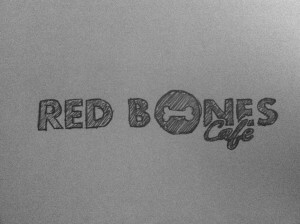 To be completely honest, I had no preconceived notions of what to expect from the Red Bones Café, in fact, I had never heard of them before this class. So with a quick a Google search and browse of their Facebook page, not to mention a few suggestions from others in the class, I quickly decided that I was going to have to try out their catfish for myself. After a minor mishap with the GPS, which apparently isn’t a fan of some of those goofy streets downtown in Sioux City, I arrived at the Red Bones Café. The yellow painted building certainly stuck out in it’s location, both for it’s size and color in comparison to the buildings around it. Their large sign above entrance was noticeable, but was only really visible to drivers coming from the one direction. Their logo appears a little too ornamental, which potentially could lead to some readability issues, particularly with the color scheme on the sign, and the black text with an orange outline on a dark background. That’s not to say the ornamental typeface was an entirely bad choice, just an area of improvement. They also had their “food for the soul” slogan on the board, but lights seemed to be blocking it from the passerby. Entering the restaurant, the first thing that struck me was their decorations, color scheme, and overall appearance of the dining area. It fit their personality and their food perfectly. It felt like I just stepped into someone’s home kitchen and was prepared to eat the daylights out of their home-cooked meal. I also noticed that the dining area isn’t very large, so with a large group like ours, the place filled up quickly. It felt a little crowded when it got really full, but it wasn’t entirely a bad thing because of the environment and that “at-home” feel. You could even see some of the waitresses and cooks preparing the food through the back, which, again, added to that “at-home” feeling. 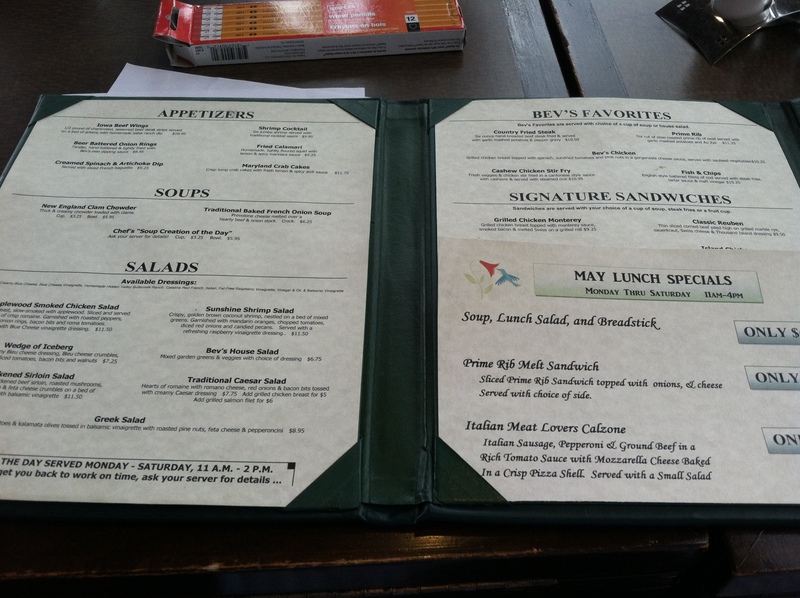 The menu was large, single sided, color print. I was pleased to see that they had kept the ornamental font they used in their logo to only their logo and it didn’t become a reoccurring theme throughout the menu. 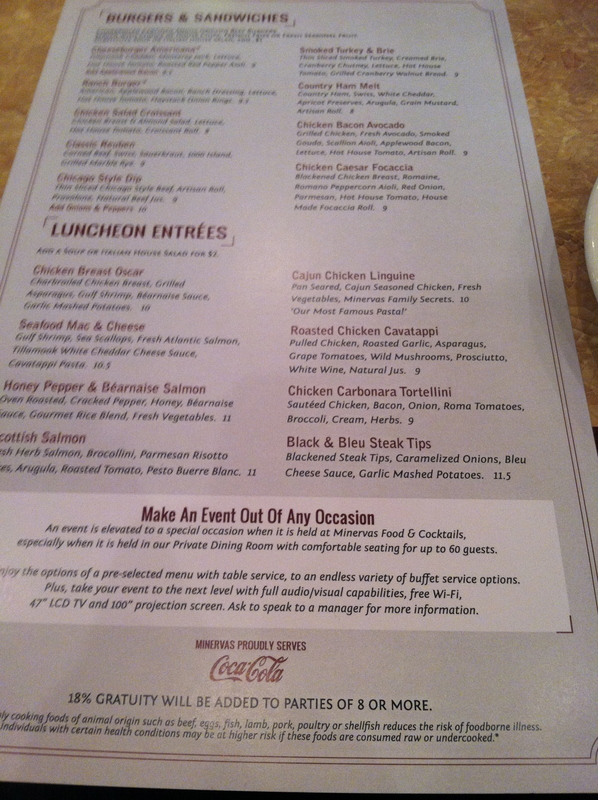 Their menu was more or less easy to navigate as they had their items sectioned off nicely, but the text was centered within columns, which did lead to a readability issue. 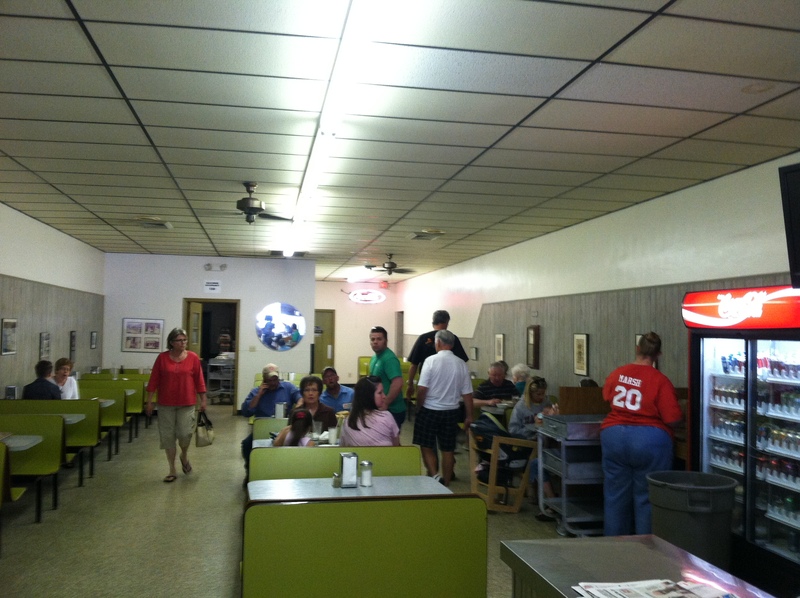 Their menu was full of southern-style foods, fried chicken, fried catfish, country-fried steak, baked beans, collard greens, and more. They had a nice variety of items and there seemed to be something for everyone. 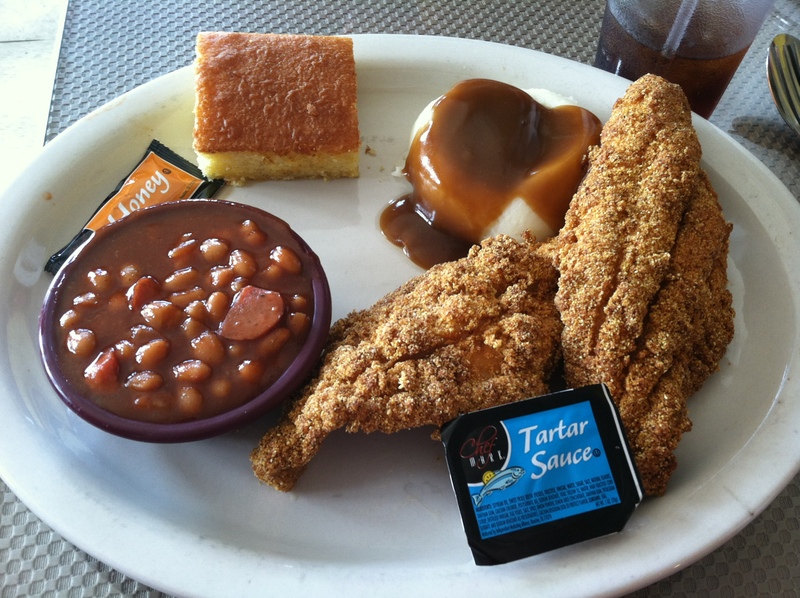 Fried Catfish, baked beans, mashed potatoes, and cornbread. As I said earlier, I ordered the catfish, and I added baked beans and mashed potatoes and gravy for the sides. 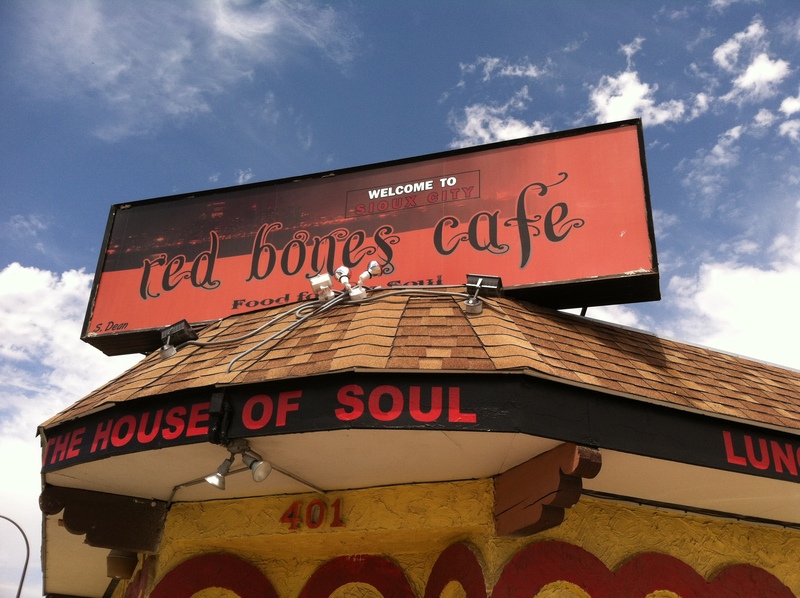 The waitress who helped us was very friendly; service was clearly a priority at Red Bones. When the food arrived, I was impressed by how much they gave you. The presentation of the food was good too, with the baked beans in a cup on the side. After a few quick photos, I dug into the catfish. It had good flavor and was definitely catfish, though the breading wasn’t my personal favorite. It was a bit too much breading in relation to the fish and it was corn meal breading, which is not my first choice. Most of this is because I like the way my family breads fish with a cracker and a potato flake mix. This is not to say the flavor was not good, there was just enough catfish flavor to go along with the breading. 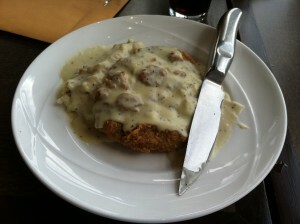 The mashed potatoes and gravy were also good, with the gravy as the highlight there. 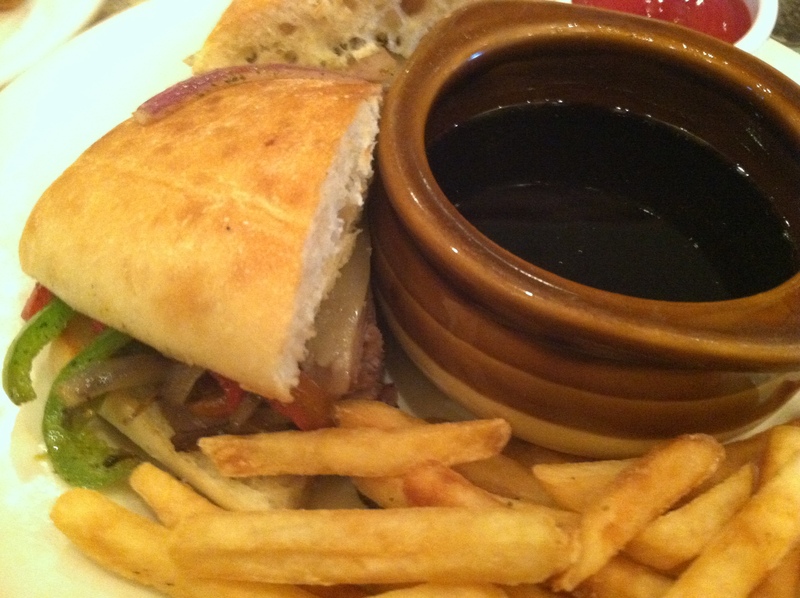 The gravy was flavorful without being too salty and went really well with the potatoes and other food choices. The baked beans were my favorite part. They were a little sweet and a little tangy with right amount of spices that didn’t overpower. The pieces of sausage in the beans were a nice addition to the flavor. 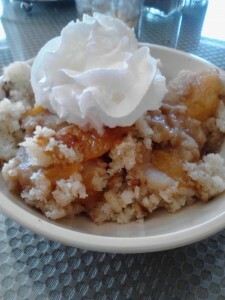 For dessert, I shared a peach cobbler with a friend. It was good and tasted like something you’d expect from a home kitchen. You could still taste peaches and the cinnamon flavor was at the right level. Unfortunately, the whipped cream they added had melted some, which is not something I prefer, but I would definitely order it again, but ask for it without the whipped cream. 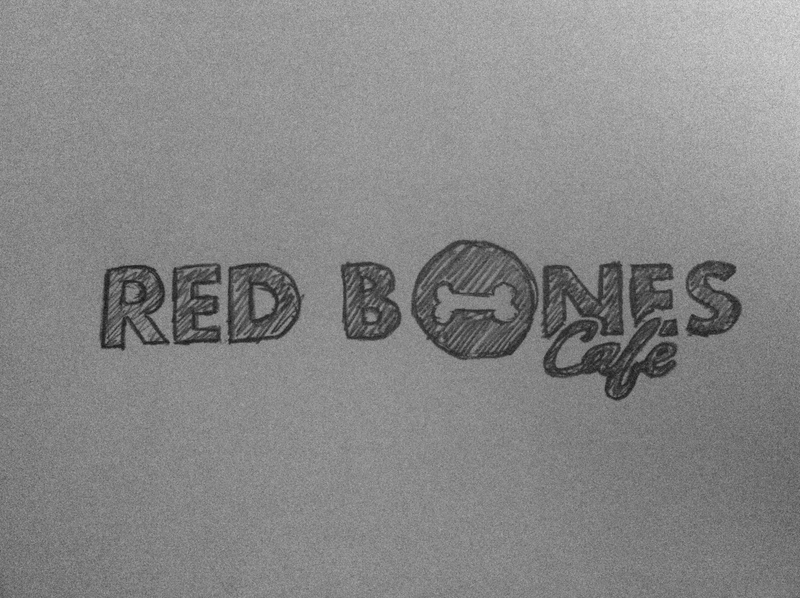 It was an overall good experience eating at Red Bones Café. The food was flavorful and the atmosphere fit what they were going for. Their identity could use a little work and their menu needs a few typographical changes, but neither was overly detrimental to their business at this stage. My clear favorite of all their identity is their tagline. I think it represented what they wanted to accomplish well and I hope they keep that around for years to come. I would like to go back in the future, but next time I think I will have a harder time deciding what to get because there are so many things on that menu that I’d like to try! An hour’s worth of doodling led to this quick idea. Here’s a fun fact for you, one of the best way to counter the summer heat is with a cold beer and barbecue. Shocking right? 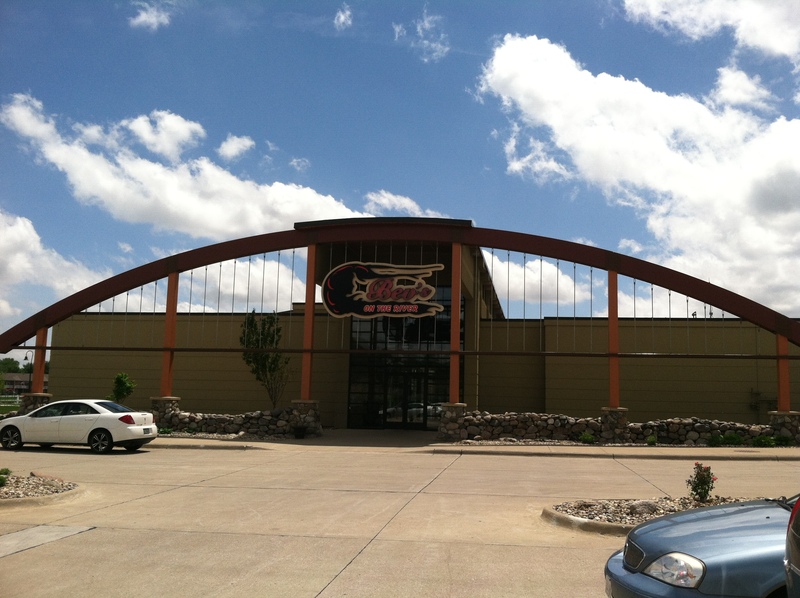 Well, today had a high temperature over 100 degrees, so it was a perfect time for an expedition to The House of Q, a rather popular Sioux City barbecue restaurant. Having never been to the restaurant before, all I hoped for was a decent rack of ribs and an air-conditioned building. 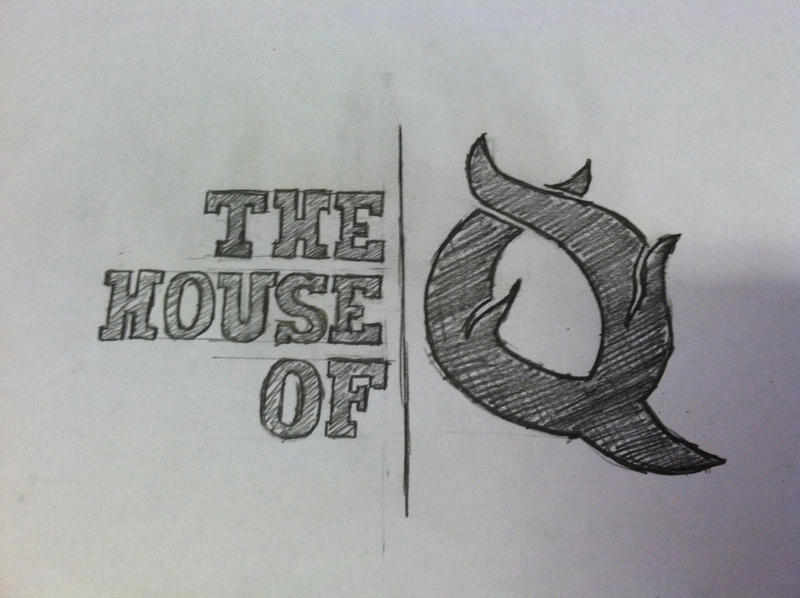 My expectations were obviously set much too low for The House of Q because they knocked it right out of the park. 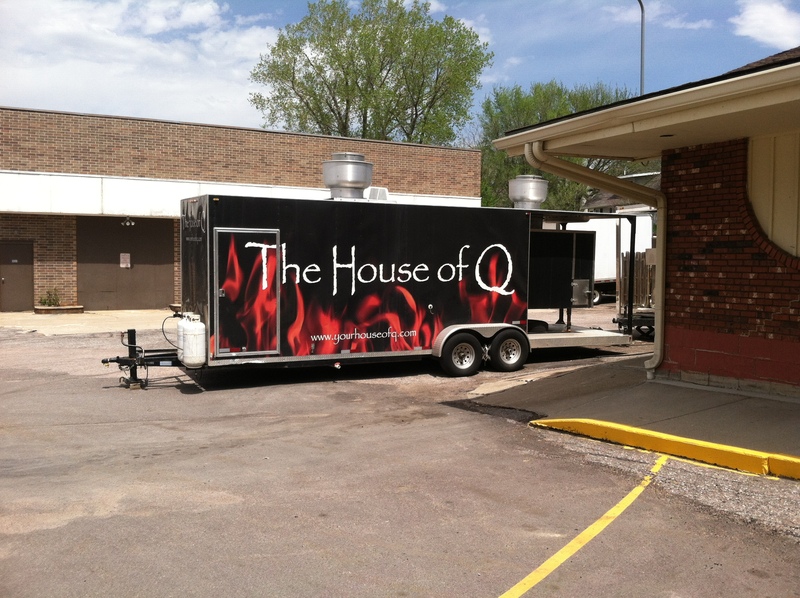 Although I had never been to the restaurant itself, I have had a pulled pork sandwich from The House of Q catering service before. Thinking back on that pulled pork; I could remember how tender the meat was. The barbecue sauce was nearly perfect in my opinion, it had a little bit of a tangy taste to it, but not overpowering that it greatly affected the flavor of the meat. There wasn’t enough of the smoky barbecue flavor to the meat though, but that didn’t greatly diminish the sandwich. With this in mind, I was looking forward to seeing what all they had on their menu. Could do without the Papyrus-like font, but the brand is identifiable. As a graphic designer, I notice things that others probably wouldn’t. Anytime I go to a restaurant, I tend to critique their branding and identity, menus, ads, and anything else that represents the restaurant. Most of the time I keep my thoughts to myself, but I have been known to share my thoughts with whoever is closest, and whether they understand what I’m talking about is beyond the point. So, upon arriving at The House of Q, I first noticed their vans and vehicles, all with their branding clearly visible on the side of the vehicles. I let out a small groan and cringed a little when I saw their logo design. The use of Papyrus font is a collective no-no in the design world. It tends to be over used and doesn’t translate well to various formats, particularly when you use it on the web or on promotional items, both of which were issues for The House of Q. Now, I’m assuming they were using a font very similar to Papyrus because of it’s worn and distressed appearance, but there are better ways to go about that. The use of flames isn’t a bad choice, but personally, I was not a huge fan of the flames in the logo. Despite this, I was impressed with how consistently they used their branding and how easily definable their promotional and vehicles were with that same appearance. Inviting appearance as you step inside. Stepping inside the restaurant, I was impressed by how open and large it was. The outside of the building did not do it justice for the size inside. I expected a large number of tables and not much room to move around, but instead it was a comfortable and relaxed environment. One of the first things just about everyone noticed right away was the beer bottles that lined the ordering counter. I could only assume they had a huge beer list and was interested in seeing what all they had. As it turns out, there was a front and back page of beer choices, most of which I had not heard of, and some of which I couldn’t even pronounce. After browsing the beer list, I looked at the regular menu. 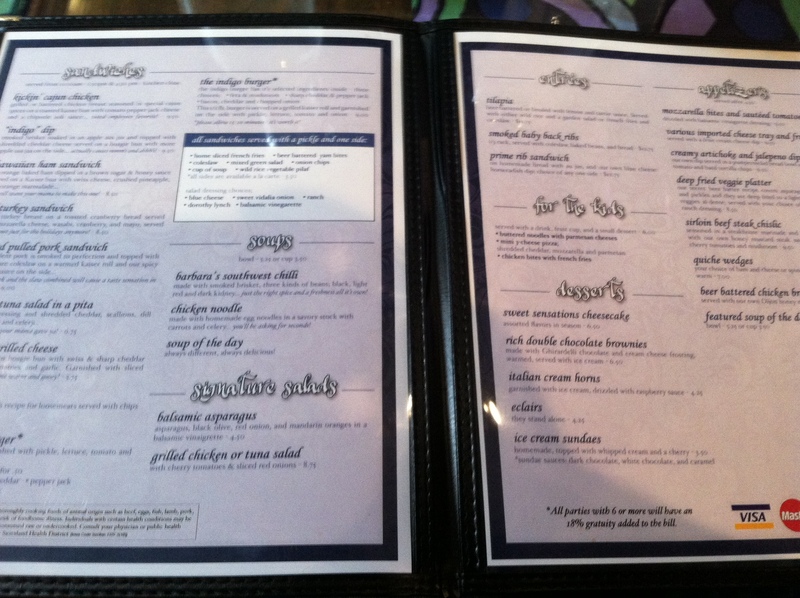 I had mixed reactions to the menus that they were black and white sheets of paper stuffed with all the different options. I was impressed by how large and full the list was, and that for many of their items they conveniently described what the meal was. 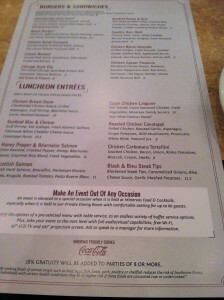 Unfortunately, the menu was almost too stuffed with information that it made it a little difficult to navigate. Some of the typography and layout was not as clean as it could have been, which added to the readability issues. 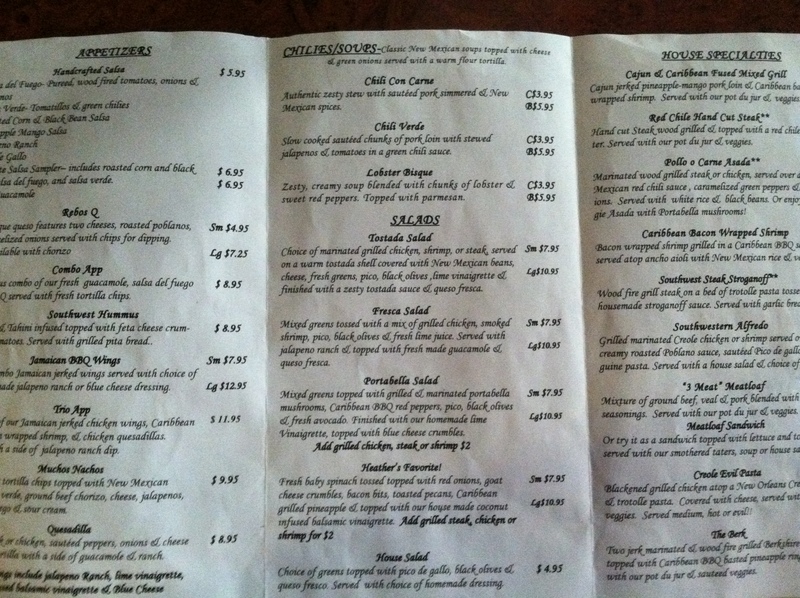 Definitely not the worst menu I’ve laid my eyes on before, but not the best either. 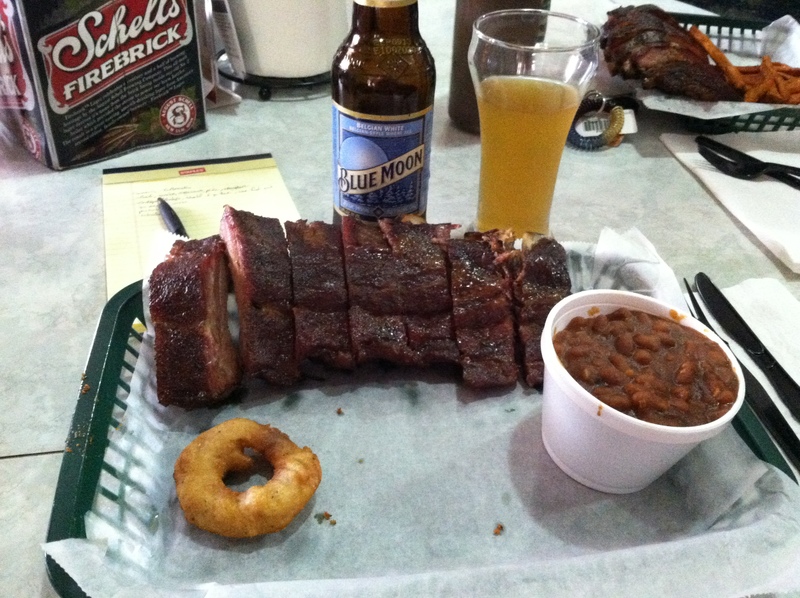 I ordered a 1/2 Rack of Ribs, smoked beans, and washed it down with a Blue Moon. Enough of that, let’s get to the food. I ordered a ½ rack of pork ribs and smoked baked beans. To drink I stuck to one of my favorites, a Blue Moon. Instead of ordering at the table, we were to go up to the food counter and order there. It was a quick and painless process with the staff being helpful and friendly. In fact, it was the owner himself who took our order. The food was brought out very quickly, especially for our large group of 20. The aromas of the various barbecue and food swirled the room as the waitress delivered our food, only making those who had yet to receive it hungrier. The food, including mine, was served in plastic baskets and the silverware was all plastic, lending to the “finger-food” idea. The ribs were cooked with a dry rub and were given 4 options for barbecue sauce to add: original, honey, chipotle, and spicy. I remembered the original sauce from my previous experience with the pulled pork sandwich and chose that. The meat was tender and moist and cooked to perfection. Like the pulled pork sandwich, I didn’t get enough of a smoky taste in the meat like I would choose, but again, it didn’t greatly affect the overall flavor. 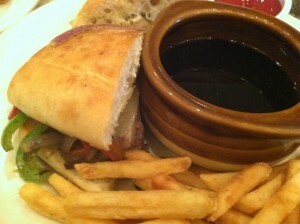 The barbecue sauce enhanced the flavor allowing for a really enjoyable meal. After going through my first rib like it was nothing, I remembered I still had yet to try the beans. They were delicious and full flavored. They were of the right consistency, with the sauce being not too runny and not to pasty. They were the perfect side for the ribs in my opinion. The size and proportion was appropriate for the amount I ordered and the price of the meal, which in total was around $12 with the side. The restaurants personality is really felt throughout the experience. The environment of the restaurant was inviting and comfortable. 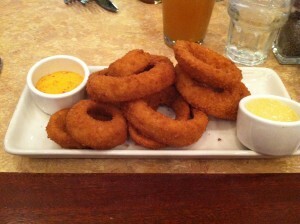 It was very family friendly, particularly with their “finger-food” options. It’s also a good place to go when you’re looking for a good meal and not looking to break the bank. And if you’re the competitive eater type, they had something for you too with their Q-Zilla Challenge. You could really get a feel for the owner’s personality in the restaurant, based off the décor and 60’s music playing in the background. All in all it was good experience, and the food definitely made it worth it. The only thing I saw that could use some improvement was in their branding and visual identity. 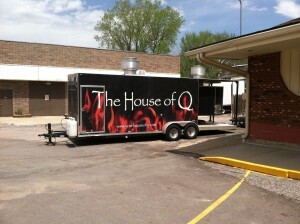 I suggest the House of Q to anyone in the Siouxland area looking for some good and legitimate barbecue. 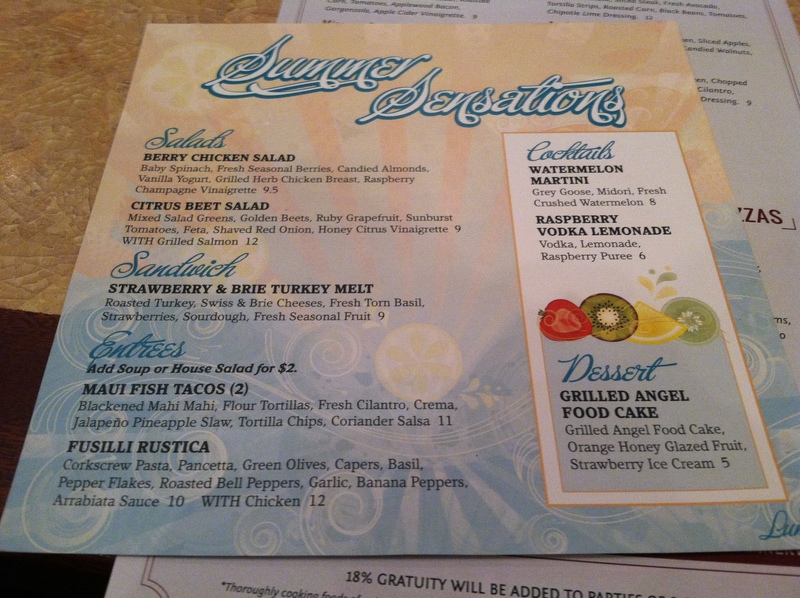 Fellow designers, try to ignore the Papyrus and just enjoy the food! 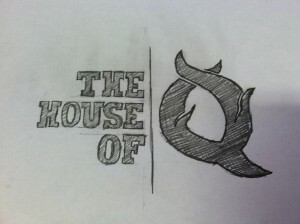 A reoccurring theme for this blog – every restaurant I visit, I’ll spend an hour doodling up a logo approach.